Working Method Contemporary will preset Cracked Actors on February 9th from 7:00 pm to 9:00 pm. 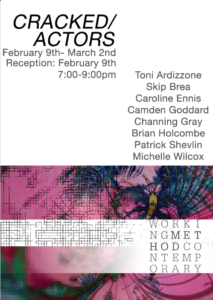 This is the opening reception for Working Method Contemporary’s February exhibition. The show will feature work by the MFA class of 2020. The opening reception is free and open to the public.